One of the most difficult skills to master in the English language is that of writing. Here we will look at some basics for writing that will help students improve their own practice. To get started, take a look at this presentation. 4. Writing a Rough Draft. 5. Editing. This usually takes more than one time. Writing includes all of the steps mentioned, but it includes more. There are subtleties in writing that we need to be aware of, but they are sometime hard to describe. Writing needs a STYLE. A WRITER’S STYLE IS WHAT SETS HIS OR HER WRITING APART and makes it unique. Style is the way writing is dressed up (or down) to fit the specific context, purpose, or audience. Word choice, sentence fluency, and the writer’s voice — all contribute to the style of a piece of writing. How a writer chooses words and structures sentences to achieve a certain effect is also an element of style. When Thomas Paine wrote “These are the times that try men’s souls,” he arranged his words to convey a sense of urgency and desperation. Had he written “These are bad times,” it’s likely he wouldn’t have made such an impact! Style is usually considered to be the province of literary writers. Novelists such as Ernest Hemingway and William Faulkner and poets such as Emily Dickinson and Walt Whitman are well known for their distinctive literary styles. But journalists, scientists, historians, and mathematicians also have distinctive styles, and they need to know how to vary their styles to fit different audiences. For example, the first-person narrative style of a popular magazine like National Geographic is quite different from the objective, third-person expository style of a research journal like Scientific American, even though both are written for informational purposes. What changed was the audience. The first passage was written for a professional journal read by other biologists, so the style is authoritative and impersonal, using technical terminology suited to a professional audience. The second passage, written for a popular science magazine, uses a more dramatic style, setting up a conflict between the butterflies and the vines, and using familiar words to help readers from non-scientific backgrounds visualize the scientific concept being described. Each style is appropriate for the particular audience. Many elements of writing contribute to an author’s style, but three of the most important are word choice, sentence fluency, and voice. Good writers are concise and precise, weeding out unnecessary words and choosing the exact word to convey meaning. Precise words — active verbs, concrete nouns, specific adjectives — help the reader visualize the sentence. Good writers use adjectives sparingly and adverbs rarely, letting their nouns and verbs do the work. Good writers also choose words that contribute to the flow of a sentence. Polysyllabic words, alliteration, and consonance can be used to create sentences that roll off the tongue. Onomatopoeia and short, staccato words can be used to break up the rhythm of a sentence. Sentence fluency is the flow and rhythm of phrases and sentences. Good writers use a variety of sentences with different lengths and rhythms to achieve different effects. They use parallel structures within sentences and paragraphs to reflect parallel ideas, but also know how to avoid monotony by varying their sentence structures. Good writers also arrange their ideas within a sentence for greatest effect. They avoid loose sentences, deleting extraneous words and rearranging their ideas for effect. Many students initially write with a looser oral style, adding words on to the end of a sentence in the order they come to mind. This rambling style is often described as a “word dump” where everything in a student’s mind is dumped onto the paper in no particular order. There is nothing wrong with a word dump as a starting point: the advantage of writing over speaking is that writers can return to their words, rethink them, and revise them for effect. Tighter, more readable style results when writers choose their words carefully, delete redundancies, make vague words more specific, and use subordinate clauses and phrases to rearrange their ideas for the greatest effect. Because voice is difficult to measure reliably, it is often left out of scoring formulas for writing tests. Yet voice is an essential element of style that reveals the writer’s personality. A writer’s voice can be impersonal or chatty, authoritative or reflective, objective or passionate, serious or funny. Style is the way in which something is written, as opposed to the meaning of what is written. In writing, however, the two are very closely linked. As the package for the meaning of the text, style influences the reader’s impression of the information itself. Style includes diction and tone. The main goal in considering style is to present your information in a manner appropriate for both the audience and the purpose of the writing. Consistency is vital. Switching styles can distract the reader and diminish the believability of the paper’s argument. Diction is word choice. When writing, use vocabulary suited for the type of assignment. Words that have almost the same denotation (dictionary meaning) can have very different connotations (implied meanings). Besides the level of formality, also consider positive or negative connotations of the words chosen. Some types of diction are almost never advisable in writing. Avoid clichés, vagueness (language that has more than one equally probable meaning), wordiness, and unnecessarily complex language. One way to achieve proper tone is to imagine a situation in which to say the words being written. A journal might be like a conversation with a close friend where there is the freedom to use slang or other casual forms of speech. A column for a newspaper may be more like a high-school graduation speech: it can be more formal, but it can still be funny or familiar. An academic paper is like a formal speech at a conference: being interesting is desirable, but there is no room for personal digressions or familiar usage of slang words. In all of these cases, there is some freedom of self-expression while adapting to the audience. In the same way, writing should change to suit the occasion. Anything you write should still have your voice: something that makes your writing sound uniquely like you. A personal conversation with a friend differs from a speech given to a large group of strangers. Just as you speak to different people in different ways yet remain yourself, so the tone of your writing can vary with the situation while the voice -- the essential, individual thoughts and expression -- is still your own. “The notes I handle no better than many pianists. But the pauses between the notes—ah, that is where the art resides.” - Artur Schnabel (1882–1951), German-born U.S. pianist. These two musicians expressed the same thought in their own unique voices. Label each sentence as formal, casual, or slang based on its diction. * Let’s go get some dinner. * It is vital to understand the text one reads. * Computers are a pain in the neck. * The Mona Lisa looks weird from up close. * Pickett’s charge at the Battle of Gettysburg was surely an awe-inspiring sight. In the following sentences, choose between the words in parentheses to make the sentence have as negative a connotation as possible. * The leader was his nation’s most (notorious, well-known, famous) advocate. * The people (thronged, flocked, swarmed) to the large cities. * A (trim, skinny, slender) woman entered the room. * The man was (funny, annoying, interesting). * Where did you find that (outfit, get-up, attire)? The following paragraph has several inconsistencies in its style. Correct the inconsistencies. When writing a term paper, the one thing you’ve got to remember is to use authoritative sources. These are vital if the paper is to persuade the intended audience. Reliable sources can be found everywhere from the library down the street to the internet. Internet sources must be used cautiously, since some sites are just run by wackos; nonetheless, some sites do provide quality information. Once the writer has found her sources, she must remember to cite them properly in order to avoid plagiarism. Plagiarism is bad. Citation styles vary across the disciplines, but they can usually be figured out with a proper style manual. Pace is the speed at which the novel moves. It’s one of the many aspects of writing for which you need to find the correct balance. Too slow and it’ll bore the reader into closing the book; too fast and frantic and it’ll unsettle them and won’t be a comfortable read. Just as in real life, readers need breathers now and again. The trick is to get this balance right, and I don’t think anybody can tell you where to find that balance. It’s one of the decisions you as the writer must make. The pace you choose will depend, for example, on your style as a writer. For example, Elmore Leonard, who writes very fast-paced books, is quoted as saying, “I try to leave out the parts that people skip”, and nobody can deny that his books are fast-paced. As a contrast, consider any of the older novels, such as Jane Austen’s. Their pace is much slower. I would suggest that you have your novels more quickly paced than Jane Austen’s however. People are more impatient now, there are too many other things competing for their attention - they don’t have the time or interest for leisurely pacing. But whether you go as high-paced as Elmore Leonard or not, is the decision you must make. It depends on your own tendencies, your genre, and your readership. But no matter what the overall pace of your stories are, it must vary within the story. Try to alternate fast-paced scenes with slower ones. That way your reader will enjoy the excitement of the action, but will also get a rest, a chance to recuperate (if you’re doing your job right, your reader will have a huge amount invested in the book and will be as exhausted at the end of the high-action scene as your characters, and will need as much of a break!). So what makes pace? What’s the accelerator, and what’s the brake? Action is the accelerator. Whenever something’s happening, you have a brisk pace. The brakes (or breaks!) are things like description, and rumination by characters. * Have a lot of action, a lot of stuff happening (to whatever extent is appropriate for your novel). * Avoid having much (if any at all) description, and make it terse and hard-working. * Avoid rumination by the characters. * Have the narration be close-up. If it was a film, the camera would be focussed on the action, on the people - rather than having a panoramic vista. Tell the story the same way, e.g. the beads of sweat on the face rather than, say, the streetscape. If you want to describe what’s happening to the streetscape, then do so through detail - the overturned chairs, perhaps. * Have everything from the viewpoint character’s POV, even if the rest of the story is in Third Person Omniscient. (If this doesn’t make sense, it will after you read the Point of View section). * Have short snappy sentences. A good rule is to do all possible to avoid commas, as commas facilitate longer sentences. * Cut adverbs and adjectives to an absolute minimum. Use stronger nouns and verbs. * Dialogue should be abrupt and to the point. You won’t have your characters saying hello or commenting on the weather; they’ll be straight to the point. And that point should be high-stakes - advancing the plot. * You don’t need as much, or any action. This is the time for reflection and description. If you do have action it can be gentle (e.g. making tea, journeying) rather than frantic. * Have a wide viewpoint - like a camera panning back. Think of the film Lord Of The Rings - in the journeys they took in between their fights, the camera often panned back to show them riding or walking in their environment. * Dialogue can be more relaxed. It should always have a point to it - in novels characters don’t talk for the sake of it. But the point can be wrapped in pleasantries, and the point can be about exposing character rather than advancing the plot. Below is the Six Traits of writing rubric that can be used to help students assess their own work. In fact, this rubric is one of the ones we will be using this year. This is also how I will be evaluating student work, using these rubrics. Here, also, is the Quick Scale from the Ministry of Education curriculum. There are rubrics for different kinds of writing. This one for report writing (see PG. 20) is important this year as we will be focusing on that style in preparation for high school. Now, to a big question everyone has..."How am I getting graded?" Well, we will be using Assessment For, As and Of Learning. That means that students will be assessing their own work and their peer's work for learning and improving their final product. During this process, the teacher is also helping students with questions and improvements. 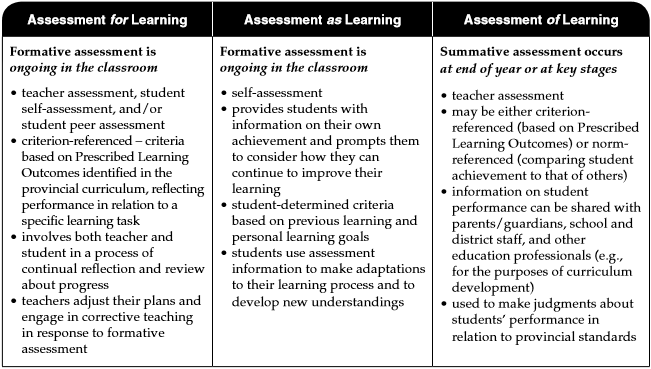 Below is an explanation of Assessment For, Of and As Learning. A rubric can be translated into a letter grade by having a grade equivalent assigned to a row. For example, in the Six Traits rubric above, you could say that if a student got the majority of their evaluation in column 6, EXEMPLARY, then they would get an A. The next column, 5 STRONG, would be a B, and so on. But not all rubrics are constructed as such, and students will rarely find their entire evaluation in a single column. This is where the teacher's professional opinion comes in. We will use the rubric and our knowledge of a student to more effectively assign a grade.